Specialists in mobile crane hire and tower crane hire, City Lifting is based in Purfleet, close to London. They have 110 tower cranes and 60 mobile cranes in their fleet, being both well-trusted and easily recognised within the industry. Providing premier customer service and the guarantee of both a modern and technically advanced fleet, City Lifting offers their staff both excellent development and training. As a valued customer since 2008 when we installed their first FT4000AP system, we understand City Lifting’s business on their two sites, Purfleet and Mundon, both of which we have supplied equipment for. With a value of over £10,000, our recent project involved the installation of both a second unit and a third at the site in Mundon. We have built a trusted and solid relationship with City Lifting since first working with them. Fueltek has been their chosen supplier of fuel equipment at both sites, and we have supplied and installed three fuel management systems in total: two at Purfleet and one at Mundon. As the United Kingdom’s largest supplier of Spierings folding cranes, City Lifting’s cranes are often seen conducting work in towns and city centres. They undertake a lot of work in the capital, even delivering a crane contract lift solution that was said to be impossible to achieve. Their crane equipment has become very recognisable, with their yellow and red colours contrasting. The FT4000AP system is a sophisticated hardware and software solution with a highly specified Fuel Access Control Terminal (FACT) that is designed to be installed at the fuelling location. Communicating with the Fueltek FMO browser-based software, it can be accessed from any location that has an internet connection. Designed to be able to offer complete control for the commercial transport industry, it’s ideal for organisations who dispense fuel to authorised vehicles on-site. 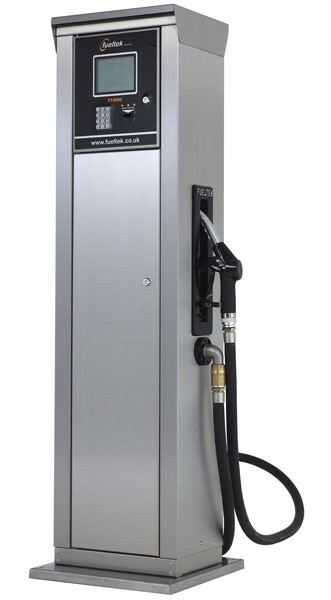 As a specified combination fuel management system and fuel dispenser, the FT4000AP can control up to four pumps at the same time – one internal and three external. The heavy-duty keypad allows for odometer readings, fleet numbers, driver ID’s, job codes, and more to be entered at the fuelling point. It also has full alphanumeric, simply numeric, and multiple choice alphanumeric keypad options. The system’s communication to Fueltek FMO allows for the programming of datatags and access devices, stock control, running reports, communication to the FACT, and data to be periodically backed up. Incorporating a report generator, it gives the ability to both create and customise reports. FT4000AP allows for datatag, mag stripe card, and datadisk access methods. At Fueltek, we manufacture datatag solutions for high-security authentication through the use of a cryptographic algorithm and a minimum guaranteed of 100,000 read/write cycles and a 10-year minimum data retention. Bill Buckley, Workshop and Transport Manager at City Lifting, complimented the longevity of Fueltek’s systems as well as our focus on customer service. He said: ”City Lifting ordered our first Fueltek system more than a decade ago, as our company has grown we have added more Fueltek systems to our network to help us control and monitor our fuel. We are very happy with the equipment and service levels we receive from Fueltek”. Here at Fueltek, we provide high-quality fuel management system solutions for your business, ensuring that you have the best possible tools offering accurate fuel data.